Looking for the best mattress for heavy people? Finding the right bed for anyone is already a challenge. It’s even more difficult for someone who may be overweight or obese. Most mattresses are manufactured with the general public in mind. Although manufacturers today are much better at designing mattresses that encompass the need of everybody, with great maximum weight capacity and higher durability, you will still need to do some research to find the mattresses that you can actually use. About the top: This hybrid design uses a euro-top surface, with nicely quilted, breathable knit cover. Euro-tops are a layer of padding stitched onto the fabric of the product. Compared to a pillow-top, euro-tops have no indentation which is more about cosmetics and less about comfort or feel. Inside the mattress: A benefit of having many layers of memory foam is that it provides a softer cushion for the body. There are six individual layers of memory foam above the layer of supportive steel coils. The gel-infused and gel memory foam help with regulating body temperature by effectively getting rid of heat for a cool, sleep experience. The base layer of coils uses 13-gauge steel for firmness and even distribution of body weight to lessen the pressure on common points of your body that may keep you from falling asleep. What other reviewers say: One drawback of the Classic Brands Gramercy is that is a two-person job for transporting. The king size weighs 122 pounds. When unpacking the product, especially when it contains innerspring, you should be careful of the mattress expanding in an explosive way. However, the mattress is extremely comfortable if you are looking for a softer sleep surface that can contour to your body. The spring coils provides firmness to keep your spine properly aligned. Reviewers have also reported the product gives off a very luxurious feel and can provide a quality sleep. Additional info: The mattress comes with a 10-year warranty and is CertiPUR certified. Note that the foundation you see in the image is not included. The Leesa is is a universally built mattress for different body weights, shape and sleeping styles. One of the great features of this American made bed is the Avena foam that provides airflow for cooler sleep, cushiony bounce, and just enough sink for you to sleep well. About the top: The cover is made from a blend of polyester and lycra. Lycra is a material found in performance sportswear that is stretchable, breathes well, and provide a nice feel. The polyester blend provides a good base material for durability. There is also a standard fire sock between the cover and the mattress foam layer that can melt in the event of a fire to smother flames. Inside the mattress: There are three layers to the Leesa. The top layer Avena foam is similar to latex in terms of bounce, cooling and response. However, the huge benefit to using Avena is its durability and hypoallergenic properties. It provides a firm support while reducing compression over time compared to most conventional memory foam like latex. Avena is also a flexible material that minimizes motion transfer as well. The middle layer gives support and pressure relief for your body. The bottom base layer is the foundation of the mattress that can provide deep compression support for heavier sleeper so no single part of their body sinks further. The deep compression support gives your body its proper alignment so you don’t wake up in the mornings with back pain. What other reviewers say: A lot of reviewers have reported being satisfied with the Leesa. It doesn’t get overly hot and has just enough edge support compared to other mattresses. One heavy reviewer reported their bed on top of the bottom plywood of his bed frame provided fantastic support. He never felt the bottom of his bed and can sleep well on his side without any problems. Couples have reported to sleep well and love the Leesa. Additional information: There is a 10-year warranty and the Leesa comes in five available sizes. The 100 nights trial is also available with free returns for Leesa purchased through Amazon. Originally, the trial was only 30 nights, but Amazon has extended the trial period and it is confirmed by Leesa as well. 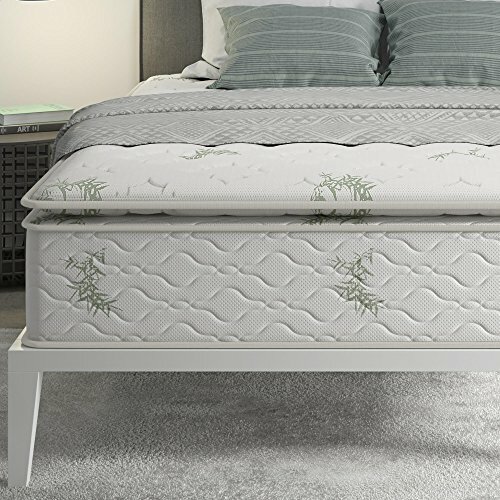 The Signature Sleep is a 13-inch coil mattress available in multiple sizes. One great feature about this product is the quilted rayon and bamboo cover, which helps wick away sweat and provide a fresh, crisp new bed feel every night. It also comes with two layers of foam and coil, with both 15-gauge and 13-gauge steel coils in the mix for a stronger edge support. Inside the quilted cover is 12 ILD foam padding for extra cushion and comfort along the surface. About the top: The mattress cover is quilted with rayon and made with a mix of bamboo. Rayon is a material that is more moisture absorbent than cotton. Together with the additional moisture absorption and hypoallergenic properties of bamboo, the cover is breathable for a fresh and cool surface, comfortable to touch and feels, and durable. The cover includes polyester and cotton jacquard material for durability and luxury feel. The three layers of individual visco-elastic support foams, known as the 3-Zone Foam provide a soft, comfortable sleep with a firm center designed for lower-back and hip support. The foam layers also provide contouring to the curves of your body for a nice, cradle sleep that relieves pressure points. In the full-size, there are 630 coils. The king-size (largest available size) has 960 coils. The edges of the mattresses use 15-gauge coils while the center uses 13-gauge coils. Although the edges are not super firm, 13-gauge coils in the center give you back a much more reliable, firm support as the tempered steel coils are thicker. What other reviewers say: Overall, many reviewers have reported an excellent sleep experience on their Signature Sleep. Although the edge support isn’t favorable as you may have a slight sink, the central mattress support does a great job giving chronic back pain users the firm surface they need to rest well. Additional information: The mattress comes with a 1-year warranty and is CertiPUR-US certified. Keep in mind the product is considerably heavy and will need at least two people to carry into your home and bedroom. The Signature Sleep will also need roughly two days to decompress. Be aware that the product may pack a punch and spring out at you when unpacking from its box. The Ultimate Sleep ComfortMax 400 is made with a material called Talalay latex. Talalay latex is a blend of botanical and domestic latex. One of the features of Talalay latex is its consistency in structure from top to bottom, from side to side. The benefit is the material provides a stronger and more durable foundation. It is firm and does not decompress to the point of no return. About the top: The cover comes with a premium cotton blend for the fabric. Cotton is moisture absorbent and light. It also creates a very luxurious, soft padding for extra comfort and better sleep. 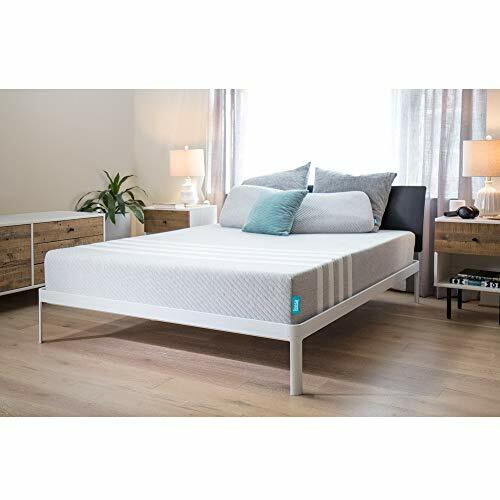 Although the product is not built with any particularly special edge support, Talalay latex is hypo-allergenic, anti-microbial, dust mite and mildew resistant. There is also no “filler” layers of standard support foam, so you only get the best material in your Ultimate Sleep ComfortMax 400. With fewer layers in design and thicker foam, you are also less likely to have body impressions where there are “holes” on your bed as you shift around during the night. In other words, the Ultimate Sleep ComfortMax 400 two-layer support provides more responsiveness and can contour to the curves of your body almost unnoticeably. What other reviewers say: Many reviewers reported being pleased with their mattress, especially the customer service care from the company. As part of ordering from Sleep Ultimate on Amazon, the company will contact you and ask questions such as your weight and preferred firmness to cater to your needs. One reviewer reported the company representative offering to add more stiffness to their mattress to support their weight. The same reviewer, over 400 pounds, has continued to report over a several months period that their bed continues to hold up without sinkage and remain firm for a comfortable sleep. Additional information: Sleep Ultimate ComfortMax 400 offers customization for special needs at no extra cost. After your purchase, Sleep Ultimate will call you to make sure that you are purchasing the right product for your need and they will discuss what else they can do for you. There is a 30-day trial period for the mattress and comes with a 10-year warranty. 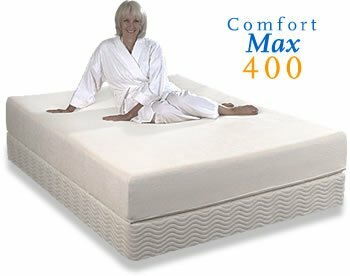 Unfortunately, the retailer has indicated that the Sleep Ultimate ComfortMax 400 is not for sale in California, Connecticut or Rhode Island addresses. 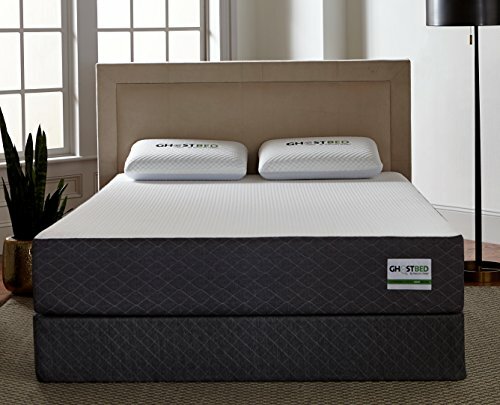 The GhostBed is an 11-inch gel memory foam mattress made in the USA. It is a mattress that is known to work great with an adjustable bed frame. The gel memory foam has gel beads embedded inside for extra heat absorption for a cooler sleeping temperature. About the top: The cover is a plush cover with zipper for easy removal. It is made of a blend of fabrics, including viscose and polyester for durability and stretchiness. It is a smooth top cover with quilted sides for a comfortable flat surface feels right up to the edge of the mattress. The washable cover can absorb moisture well and relieve heat during the night. Inside the mattress: There are three layers in the product design. The premium natural latex provides a plush and contouring feel with a non-overly soft surface. The second layer of 4 pounds of memory foam has gel beads embedded to provide a more cooling sleep with minimal pressure to your body. The final layer provides a strong support to keep the body aligned, comfort and durability for a long-lasting mattress. What other reviewers say: Most reviewers of the product reported sleeping very well. Reviewers who said they are heavy and needed back support reported the mattress to work wonders. One reviewer who weighs around 250 pounds reported a very comfortable firm surface and has minimal sinkage when sleeping on the mattress. Additional information: The GhostBed is made in the USA and comes with a 20-year warranty. There is also a 100-night trial with free returns when the product is purchased on Amazon. The materials used in its design is also CertiPUR-US certified. Innerspring mattresses tend to be the best for support because they are built to prevent body impressions, so you don’t get a sinking feeling and get trapped. In this guide, we reviewed five different mattresses for heavy people. The products are selected based on several sources, including what reviewers report on Amazon. We also researched for the best mattress for heavy people that have been designed to regulate body temperature and keep the surface cool for you to properly sleep. 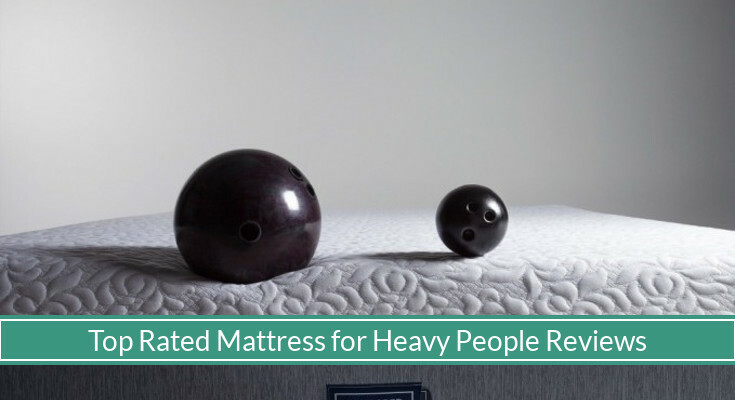 The products reviewed also support a high total weight capacity and provides the best range of firmness for overweight individuals and couples to sleep well during the night. Having a cool sleep is also another important aspect when deciding on a mattress. The product should have some form of additional cooling technology in its design to relieve heat during the night. Not all beds will be perfect for shoppers. Although it may be expensive, time-consuming, and frustrating to purchase a mattress only to return it, improving your sleep is the most important health decision you can make for yourself. 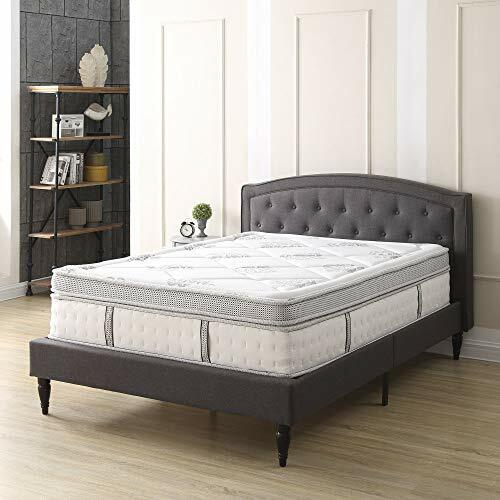 Having a 100-night trial with free returns on Amazon purchases and long warranties should also be an addition you should look out for when shopping for the best mattresses for heavy or overweight people. And don’t forget to pick a strong foundation! It will make all the difference in creating the best bed for heavy or overweight people. We hope this guide helps you on making the best decision for your money!